Unatsi. Shnee. Neige. śnieg. Neve. Whatever you call it, we have it. I did see two squirrels outside the den window, and – I’m as crazy as they are – slogged around the corner to put out a dish of peanuts. 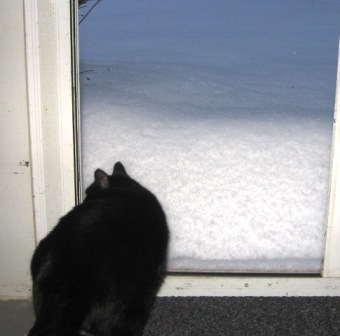 The snow was still very soft and fluffy, and each time they hopped, they disappeared under the snow. Much wiggling and throwing mini-snow volcanos, while they gathered their feet under them, and then another hop. (Notice the blue dish in the snow.) Of course, they ran away when I went out and by the time they returned, the Blue Jays had carried off the peanuts. And then the starlings arrived en masse. 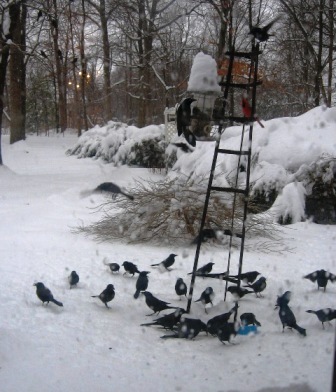 It’s no wonder we run out of birdseed so quickly. The Squire went out and shoveled paths to both bird feeders, and then walked as far as he could down the drive. About fourteen inches, a light rain right now, and more snow expected later this evening. A sort of winter lasagna. The SHA has plowed the main drag, so we have a four foot ice dam at the end of the lane. Just thank God it isn’t blowing and drifting. We may be here until Spring. I had lined up three doctor’s appointments for tomorrow, and have already “officially” cancelled one. Somebody sent me an email saying Harford County had declared a State of Emergency, with only 4-wheel and all-wheel vehicles allowed on the roads until late Saturday, so that pretty well takes care of that. We don’t live in Harford County – half a mile outside – so we don’t get these robo-calls. I wonder if there’s a way to sign up for them? ← You Talkin’ To Me?